Frame Color refers to all metal parts (back support, arm supports). Squiggle: Composed of 100% recycled polyester, Squiggle offers an innovative weave structure to create a modern organic wave pattern resembling ripples of water. 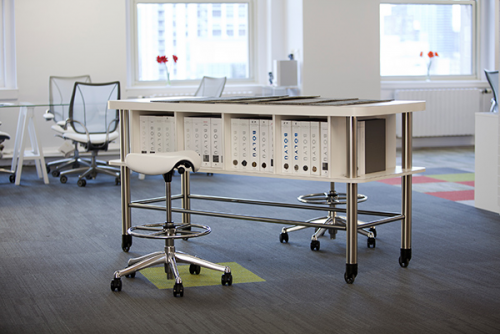 This environmentally sound textile may be applied either horizontally or vertically to Humanscale seating. Vellum: Constructed of plain weave using a blend of nylon, Cordura® and elastic yarn, this textile offers a pleasing texture and extreme durability. Because of the Cordura® content, this four-way stretch woven textile performs to the rigors of the most demanding contract environment. Wave: Developed initially for sportswear, Wave responds to the unique form and production requirements of Humanscale seating. This four-way stretch fabric exceeds all contract interior testing requirements for heavy-duty upholstery. Lotus: Water repellent and easy to clean, Lotus is an ideal textile for the healthcare and hospitality environments. 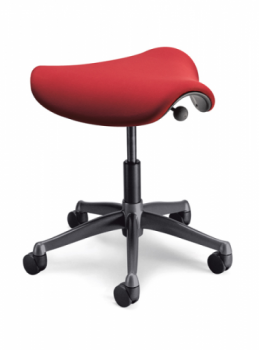 Its polyurethane finish with nylon backing boasts a soft texture that is pleasant to the touch while offering exceptional durability. Bridget Stripe: Composed primarily of renewable merino wool, Bridget Stripe offers a five-color 50-stripe pattern with shifting color sequence that creates an undisrupted movement across the surface of the fabric. Boasting exceptional durability for a wool textile, Bridget Stripe may be applied either horizontally or vertically to Humanscale seating. Ginkgo: Composed of 90% wool, Ginkgo offers a pleasing texture and durability. Its subtle and elegant pattern makes this textile appropriate for a variety of environments. Ginkgo comes in vibrant and saturated colors, expanding the scope of Humanscale's upholstery line. Sensuede: Offering style and performance, Sensuede was developed to be the best and most luxurious engineered suede available. The silky feel is the result of recycled microfibers that are breathable, extra-strong, and resistant to most stains and wrinkles. Vicenza: A lightly corrected, aniline-dyed leather produced from European hides, Vicenza receives a special retannage which enriches the leather and tightens the grain. A breathable protective finish offers durability and comfort. Cervo: Cervo is made using specialized milling that adds unique character and provides a soft, pebble grain texture unmatched by any other leather in its class. Bizon: Exceptionally soft to the touch, Bizon is a thick, rich grained leather with excellent light fastness. It offers a plain, pigmented finish that has excellent stain protection, making it ideal for any user or application. Chocolate, Sand, Navy and Espresso. Standard 5” cylinder: Appropriate for 95% of users. 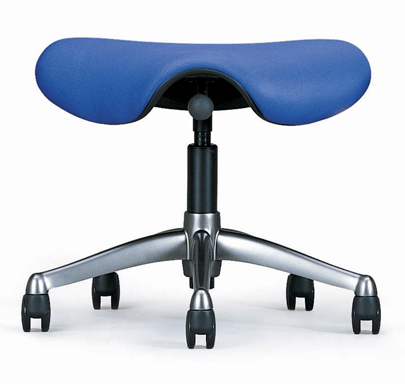 Provides seat height range of 16" to 21". L Low 3.75” cylinder: Appropriate for shorter users. 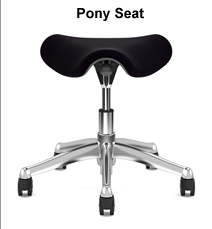 Provides seat height range of 15.25" to 19.5". T Tall 5” cylinder: Appropriate for very tall users. 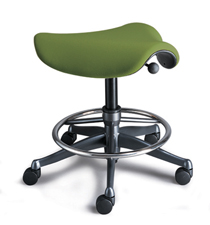 Provides seat height range of 17" to 22.25". F High 8” cylinder with 18” Foot Ring: Provides seat height range from 20.25"to 28.25" along with height adjustable 18" diameter foot ring. R High 8” cylinder with 21” Foot Ring: Provides seat height range from 20.25"to 28.25" along with height adjustable 21" diameter foot ring. 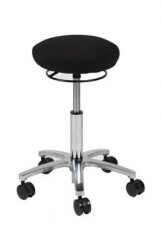 X Extra-High 10" cylinder with 18” Foot Ring: Provides seat height range from 20.25"to 28.25" along with height adjustable 18" diameter foot ring. Requires Glides or Locking casters. Z Extra-High 10" cylinder with 21” Foot Ring: Provides seat height range from 23" to 33" along with height adjustable 18" diameter foot ring. Requires Glides or Locking casters. Standard Casters: 2.25” hard double-wheel casters for use on carpeted floors. S Soft Casters: 2.25" soft double-wheel casters for use on hard floors. G Glides: Non-rolling glides for fixed location use. K Locking Casters: 2.25” hard double-wheel casters lock when someone is sitting in the chair. Standard: No fire proofing. Chair is made with standard foams and plastics. CAL 133-Approved: Fireproof barrier between textile and foam. Chair is made with fire-retardant foams and plastics. 1. How do I clean my Freedom chair? All of Freedom's cloth textiles can be cleaned with soap and water. Our waterproof textiles are best cleaned with a diluted bleach solution. Freedom chairs with leather can be gently cleansed with water or a specially formulated leather cleaner. 2. In what colors is the Freedom chair offered? Freedom is available in a wide array of textiles and colors. To view color swatches online, select Textiles from within the Freedom Chair section and click on each textile link. Note: Due to differences in how monitors display colors, online color renderings cannot be guaranteed as accurate. Please view an actual textile swatch for an accurate color sample. 3. What kind of fabric is available for the Freedom chair? The textiles available for Freedom are as unique as the rest of the chair and satisfy requirements far more demanding than typical upholstery textiles. To view Freedom textile descriptions, specifications and colors, click on the "Textiles" link within the Freedom chair section. 4. 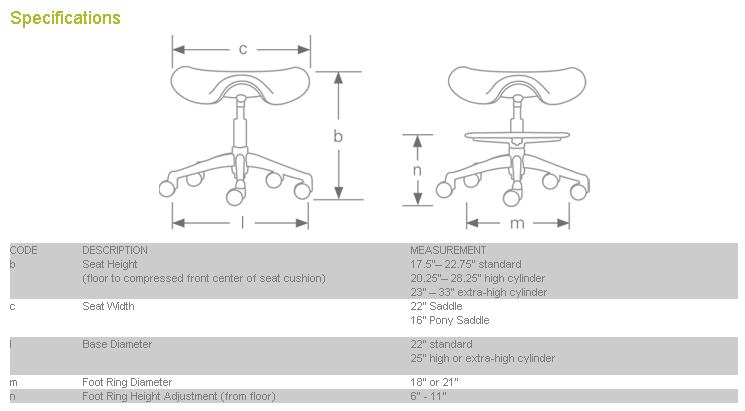 Can the Freedom Saddle Seat be ordered with a footring? Yes. 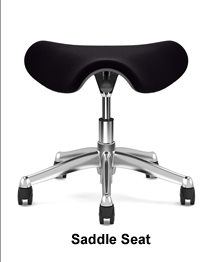 The Freedom Saddle Seat comes with high cylinder and footring options to accommodate any environment in which it is used. Call us at 877-724-4922 for more information or to place a special order. Note: Due to manufacturing reatrictions, contact us to ensure your selected options selected are 100% available.